In a mobile-first world, one of the most effective lead capture tool's is the use of "text for info" campaigns. These text campaigns remove all lead form friction and satisfy the consumers desire for instant access to information and can be used in all of your online or offline marketing. All captured leads can also be synced in real-time to top CRM's, like CINC, Follow Up Boss, Boomtown, Top Producer and others with our powerful integrations. Think of this as a frictionless and formless lead generation for your business. Here are just a few ideas of where you can use the text tool. Our text for info tool uses traditional phone numbers to allow for frictionless communication. Consumers can request information and then follow-up request with a phone call to the same phone number. This also eliminates consumer confusion of trying to text to a short code phone number. You can create your own "key" and "responses" to deliver messages. The "key" unlocks the automated response. CallAction allows for an unlimited amount of key/response combinations. You may also use our "Email Collection" text tool setting. This allows you to request a valid email to be texted to you. When CallAction receives a valid format email the system can text back your automated pre-formatted response. This is an excellent tool for public speakers to deliver information and build an email list from the stage. First, you should add a CallAction phone number to be used exclusively for "text for info". We recommend you pick an easy to remember phone number using our vanity phone number search. Click on "Call Settings" to "Text Tool"
Scroll down to "Text Tool" and turn "ON"
There are four primary settings for our text tool. Default Answer - this is the response that is sent out if the system receives a text that does not match any of your "keys". Similar to a 404 / Error message on websites. An example message: "Please text a valid "code" to receive requested information. Having trouble, please feel free to call this number"
Email Collection - if this setting is "ON", you are requesting consumers to text you a valid format email address to receive information. You can only use either "Email Collection" or "Keys" but not both simultaneously. Bulk Upload - You can also manage "keys" and "responses" using preformatted CSV files. This allows you to create and update 100's of keys and responses with a simple file upload. CSV file has three columns: "Key, Answer, Remove". The "remove" column uses "Yes" or "No" to update the file. Now you are ready to start your first text for info campaign. Enter your "Response". This is the automated reply that will be sent when the system receives a "key". The response can contain links to websites, videos, documents, etc. Users can text multiple "keys", so responses can be "daisy chained" to create a series of responses. i.e. Sign rider - text 'ADDRESS' - response tells them to text back house # of the property they are standing in front of. 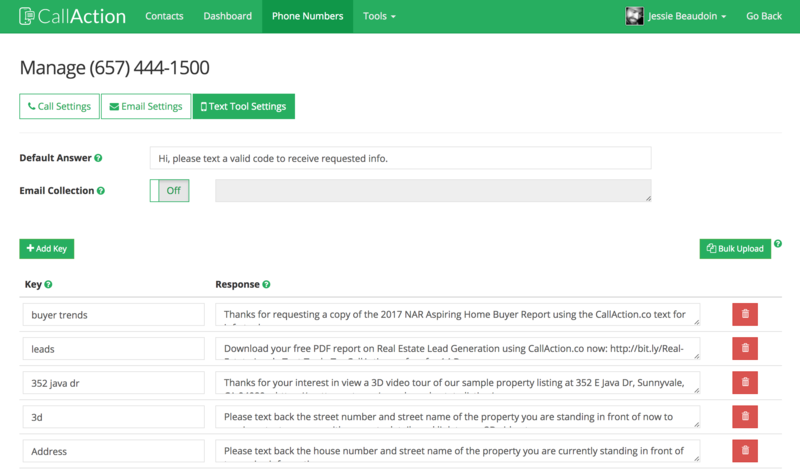 You are now ready to start using the CallAction text for info tool to generate high-quality, motivated leads. You can also integrate CallAction directly with your CRM saving you time avoiding data-entry while quickly building your database of leads. Every inbound text lead is then added to your long-term holiday drip text campaign to keep you top of mind. Not Currently Using CallAction Text for Info Tool? 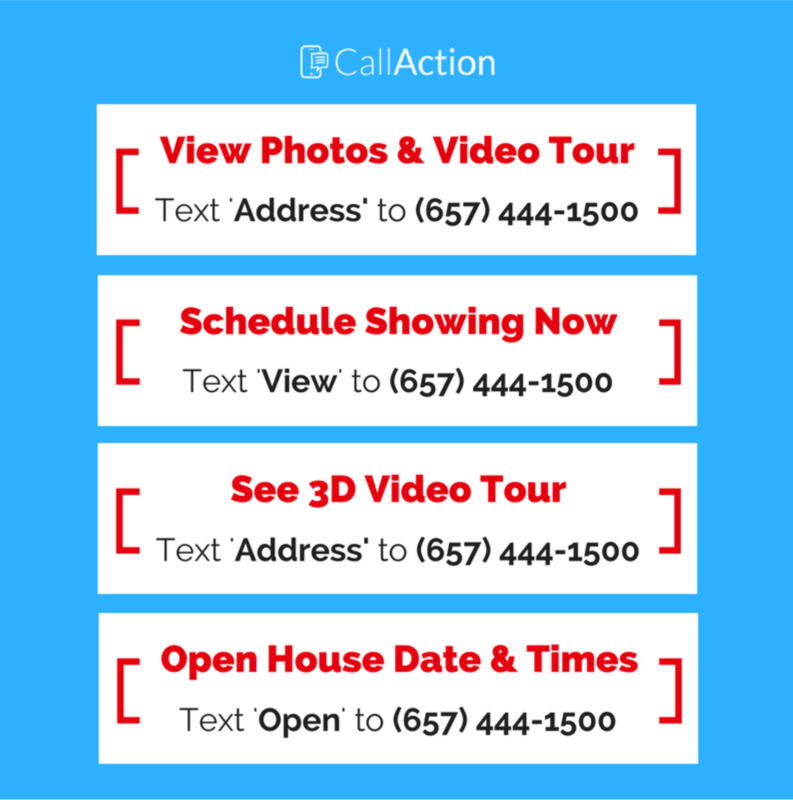 If you do any form of online or offline marketing, the CallAction text tool can help you instantly capture leads. Replace your old, time-consuming 800 call capture voicemail system with this powerful text capture tool. You can experience this first-hand with our free trial. Take 10 mins to setup a free 14-day trial today.